Training | Kapow Coaching - Edinburgh and East Lothian coaching, leadership and training. Our training programmes reach the hearts-and-minds of the whole business. We can co-create, co-deliver and co-inspire your in-house workshop. In-house training still remains one of the most cost-effective means of developing employees and providing them with role-specific support. We provide both internal courses and open programmes from our range of coach-based programmes, whilst offering a wide range of business development training, including: Values Discovery and Embedding Values, Management Skills (delegation, time management), Vision, Mission and Values, Team Dynamics as well as offering Facilitation support. 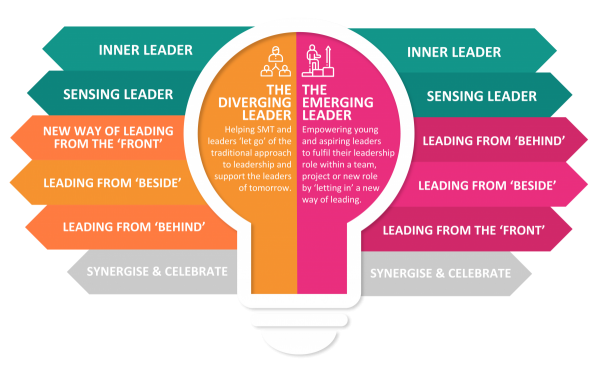 Pilot offer: 33% off our ‘full price’ Emerging Leaders - The Being and Doing of Leadership. It’s our one-off super-duper discount! £1100 per person for 5.5 leadership development, plus 4 lunch time coaching circles. Ask for our FREE Inner Leader workbook. The starting place for any leader is to explore the Being of Leadership, who you are by clarifying personal aspirations, motivations and understanding your impact on others. The Doing of Leadership explores the ‘visible’ positions of leadership via experiential learning, transferable tools and reflective practices. Accessing both ‘invisible and visible knowledge’ of leadership is the foundation for becoming an agile and flexible leader. The Being of Leadership. These two days develops your awareness of your ‘invisible’ leadership strengths of who you fundamentally are, your Inner Leader, and what you intuitively know or sense in your working world, your Sensing Leader. The Doing of Leadership. Your journey of becoming an Emerging or Diverging Leader looks at the ‘visible’ skills, attitudes and tools over 3.5 days of interactive, reflective and leadership development. You will learn to become a Leader from Behind, Leader Beside and Leader in Front. Your final half day will bringing it all together and celebrate your shared learning. The workshops will be interactive, reflective and provide you learning into current personal, professional and leadership thinking. Typical duration time is 6 months. Deepening the learning experience of the Emerging or Diverging Leader, there are 4 x 2 hour virtual Coaching Circles. These take place in between sessions. Our ‘why’: we believe coaching releases the best in others and coach-based conversations help to make people more productive and engaged, making work a more positive and psychologically safe place to be. Moving managers away from the traditional tell-sell-yell conversation to short, impactful and solution focused coach-based dialogues. Our 'view': Managers are there to enable the optimum performance in their team for the benefit of the organisation and its customers /users/ stakeholders, and to uphold standards of conduct, behaviour, results and satisfaction. With limited time, having the right conversation at the right time will be beneficial for everyone. Our Curious Conversations offers a model for powerful, dynamic change-focused dialogues in 10 minutes. For decades we’ve worked with managers to have more coach-like conversations and have realised that managers don’t need to be a coach, instead they need to learn to be more curious. Our 3-day programme looks at the typical working interactions a manager and direct report has from performance review, monitoring and giving feedback, to motivational support. Being Curious is at the heart of every conversation and our foundational tools will help support you as you move on to dealing with Challenging, Courageous and Championing Conversations. Typical duration is 4 months as the workshop is supported by 3 x 2 hour Coaching Circles. Open programme coming soon - April 2019! 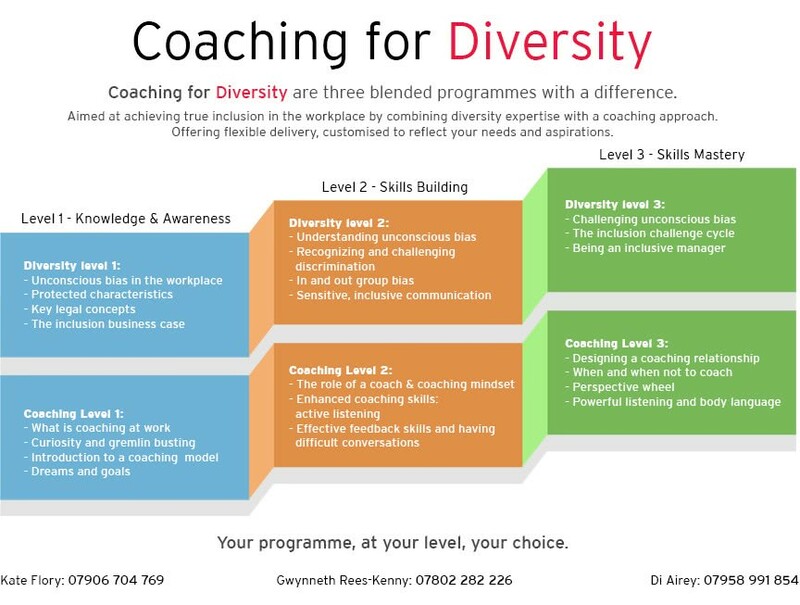 Coaching for Diversity is a GKD programme offering one, two or three one-day workshops that provide a blended approach to coaching skills and diversity training. It is designed to help achieve true inclusion starting with working at your level and for your specific needs and then through the unique blend of coaching and effective communication skills alongside current diversity training and awareness. These GKD programmes focus on understanding yourself and personal unconscious bias before fully being able to understand others. Level 1: The aim for this first day is to build ‘Awareness’ around the law and parameters of unconscious bias on a personal and professional level as well as an ‘Awareness’ of what coaching at work is. This is very much an introduction to both subject matters to an audience with no prior knowledge. Level 2: The aim for this second day is to create ‘Deeper Connection’ in order to generate trust and greater understanding around diversity and coaching. Taking the skills from Level 1 further it offers skills to allow for deeper connection in conversations. Level 3: The aim for this final day is to develop ‘Deeper Application’ of awareness around bias and how that translates into a coaching conversation. More in-depth supervision is offered at this level to help embed the skills learnt from the previous levels or from their own training. These programmes are designed to take anyone within the organisation at any level. Our unique offering is the ability to mix the level of training in both the subject areas of diversity and coaching to your specific need. If you have coaching experience with no diversity training, we can offer you level 3 coaching with level 1 or level 2 diversity. Run by an experienced diversity trainer and coach, groups of between 12 and 18 are typical. Every workplace uses mentors in their own unique way whether informally by looking after new recruits, young people or recently seconded team members or more formally through a buddy system or even matched mentor programme. This half day programme helps your organisation to strengthen your Mentoring Muscles by considering the clarity of the role, expected behaviour and the boundaries of mentoring, as well as fundamental mentoring skills. A chance to reflect upon and refesh your current mentoring training at work. "The Coaching for Diversity training organised for my team felt very bespoke. Kate really listened when we discussed in advance of the session the specific role of my team, and how their day-to-day duties might relate to Coaching for Diversity. Feedback from staff who attended was extremely positive- they felt valued because the training was designed to fit their needs. Very positive feedback as well because they were given practical ‘tools’ to use after the session. Many training providers only offer theoretical models, so it was extremely valuable to have staff walk away with confidence in using new found skills in a practical setting after only a one day session- fantastic! Would thoroughly recommend!" "Very thought provoking and enjoyable. Gets the grey-matter working." "This training course has made me take a step back and look at how I lead my team. I learned something new in each of the training sessions, and this led to me having a far greater awareness of supporting and developing people within my team. As a result I am able to trust those around me more and effectively delegate work tasks. The training has also made me look at my core values and improve my own self, and this has impacted on both my work and my personal life."